Denise has been mastering photography and photoshop for many years and sells some of her work. She hires out her skills to help people. 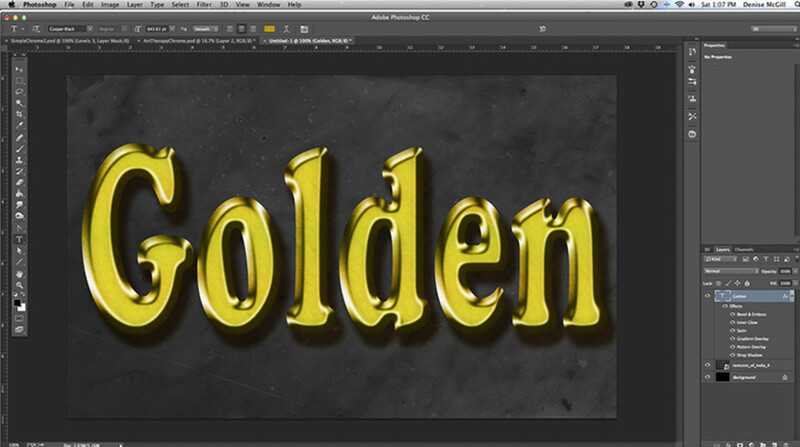 I was looking for just the right gold lettering effect to use for some banners. After much search and experimenting with several metallic effects, I chose to do this Gold lettering on a hammered metal surface. 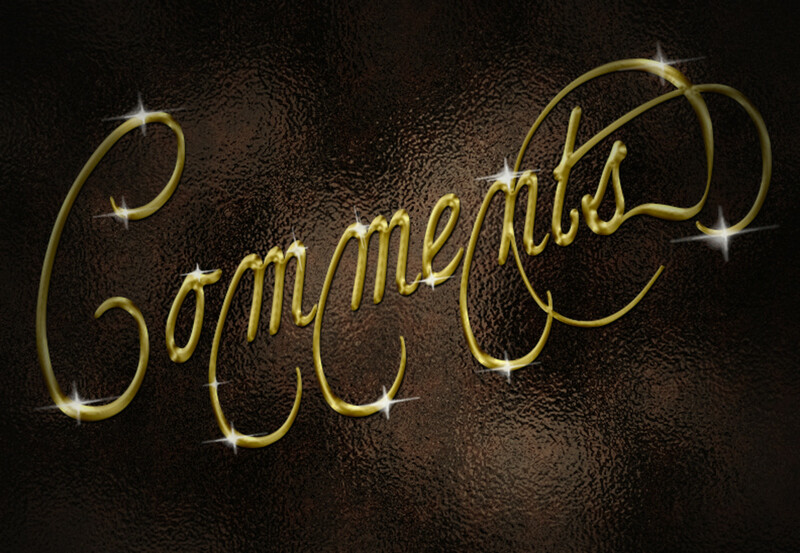 This is a fun and fairly easy gold effect for letter you can use on photos or just a dark background. It works for phrases as well as heading banners. I was very happy with the outcome for my own text uses as you will be too. I started by choosing the size of my artboard as 3” high by 12” wide and a resolution of 300 dpi. I filled the background with black by pressing opt+delete. I had to be sure that the default color settings were in place first by pressing D. You can do the same thing by grabbing the paint bucket tool and dumping black in the art board. I converted the layer to a smart object to make it more flexible. To do this I went to Layer>Smart Object>Convert to Smart Object. There are several reasons for doing this. The most important being that if you wish to use this later for another text or style you can by just double clicking on the smart object and change it without effecting anything else. The filters and effects will still be attached. 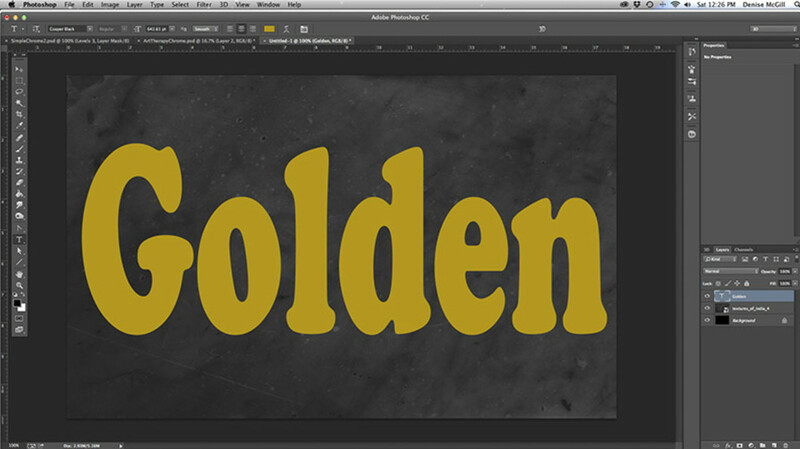 This way you don’t have to re-invent the wheel every time you want a new gold lettering banner. Do you think you might have a use for gold lettering? Maybe. Let me think about it. On this same layer, I created my effects by going to Filter>Render>Clouds. Then Filter>Render>Difference Clouds. This gave me a dark patterned effect. Then I went to Filter>Distort>Glass. 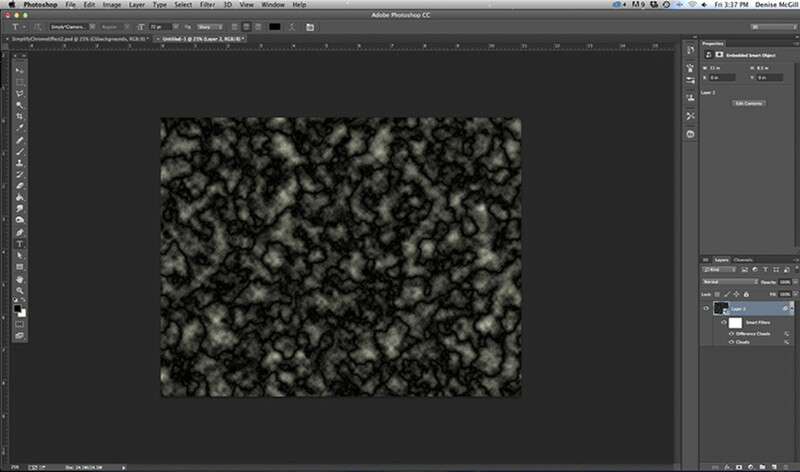 The texture stayed on the default setting of “frosted” and Scaling at 100%. Then I changed the Distortion to 15 and the Smoothness down to 2, to reduce the mottled glass to a more hammered metal look. Then I clicked OK.
You don’t need the filter mask, so right click on it and delete it. Now add a pattern overlay by going to the FX icon and click on pattern overlay. In the dialog box, click the down arrow next to pattern selection and look for “rusted metal” pattern. If it is not there, click the right button and get the pattern library dialog asking if you want to amend patterns or replace all. I choose replace all and got the entire pattern library. Change the blend mode from Normal to Soft Light. 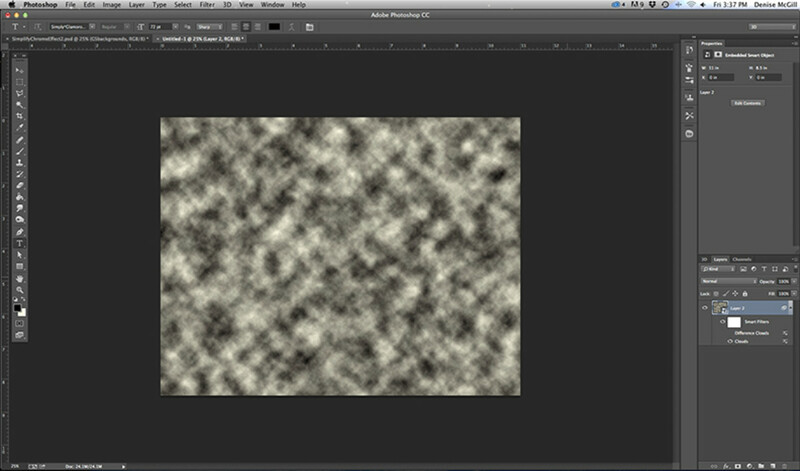 Reduce the opacity to 65% and scale to 400. 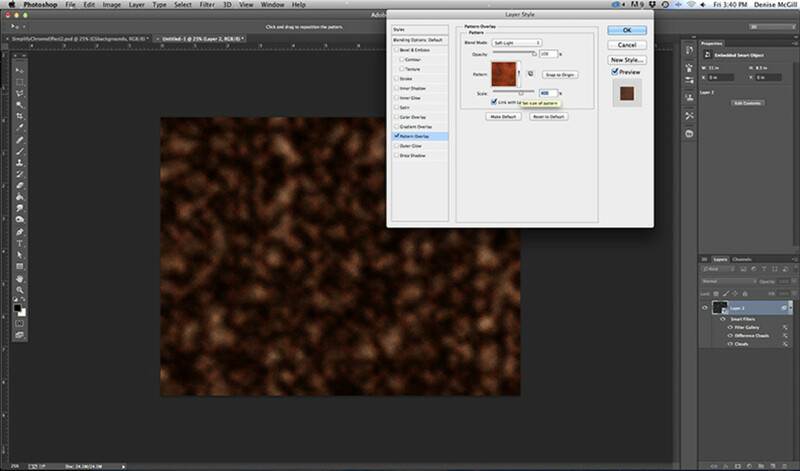 If you don’t like the effect double click on either clouds or difference clouds in the layer to regenerate the effect. The clouds are random fractal noise and just change into a new random pattern when you click onto it. This concludes the background. Create a new layer. Change the color to white. Press the Text icon and change the font to any you prefer. I chose Charlemagne Std, which is a font I got from dafont.com. Type any word or name you decide on. 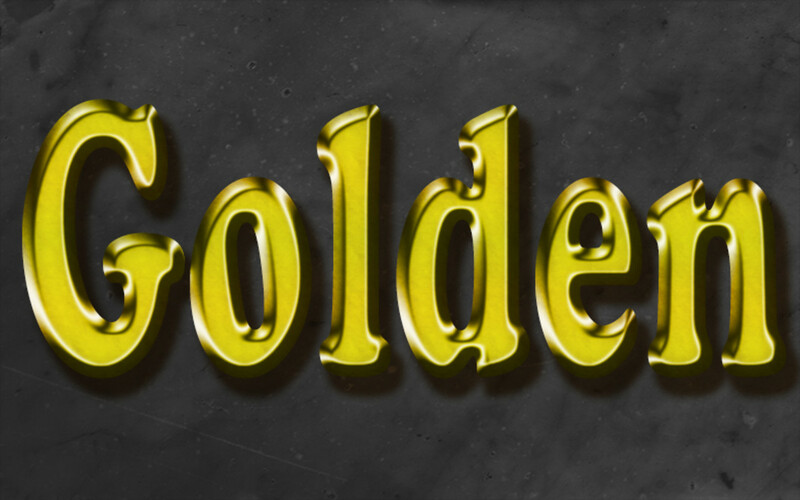 I used the word, “Golden.” Center the word on the background and scale to fit. 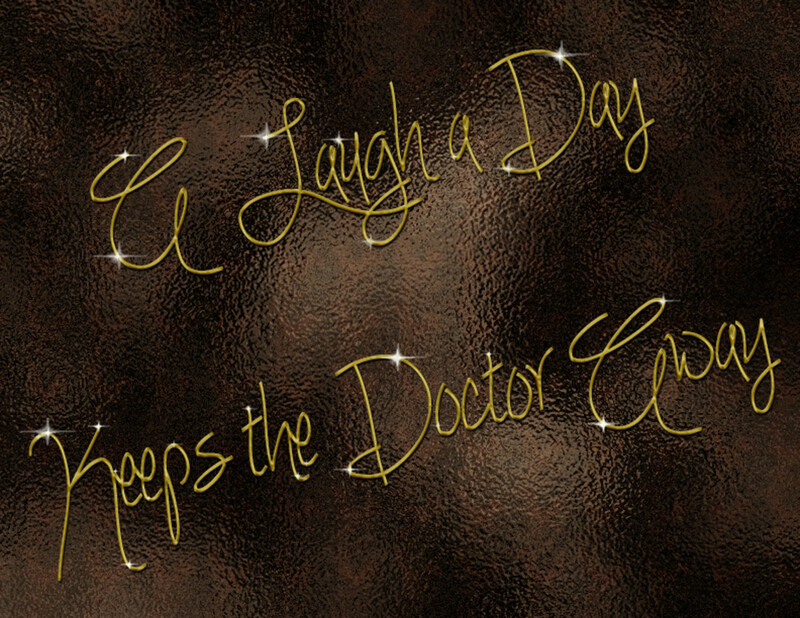 Some other fonts have thin letters like Simply Glamorous, which I love and Tagettes Plus, which I used for the phrase "A Joke a Day Keeps the Doctor Away." 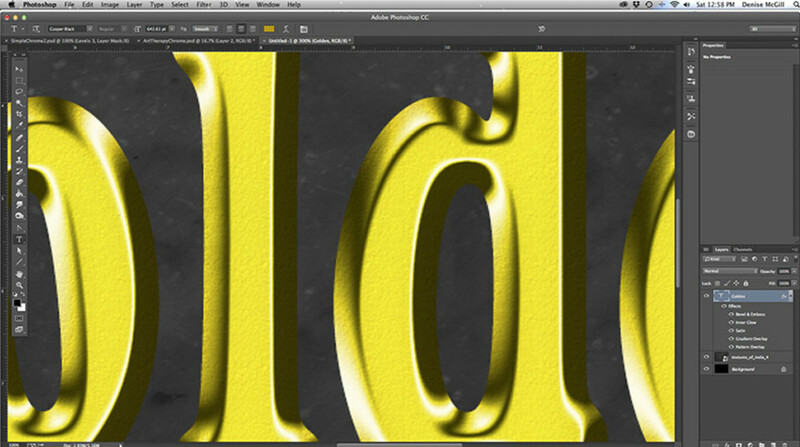 These thin letters don't give you the same depth that larger fonts have but I think they still look nice in the gold. 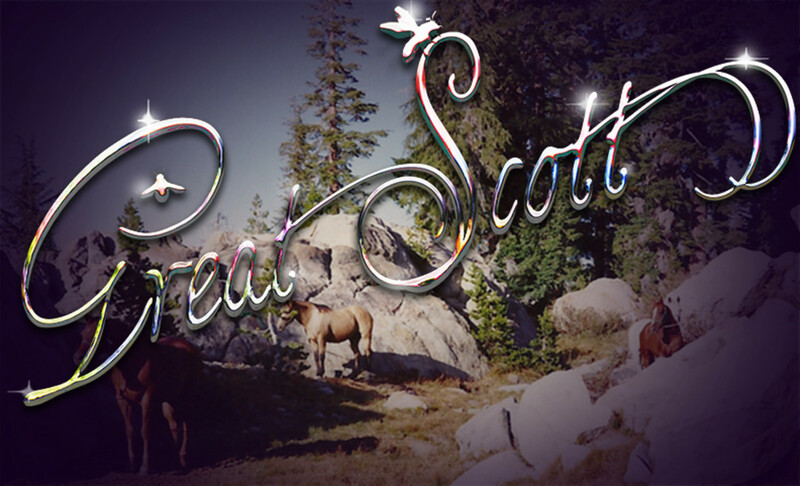 You can find some of these fonts free at Dafont. Go to the FX icon and choose Color Overlay. In the dialog box, click on the color swatch and change the H to 50, S to 85% and B to 100%. This gives you a bright yellow. But gold is not that yellow, so reduce the opacity to 35%. Change the Blend Mode from Normal to Multiply. Click the Drop Shadow button. 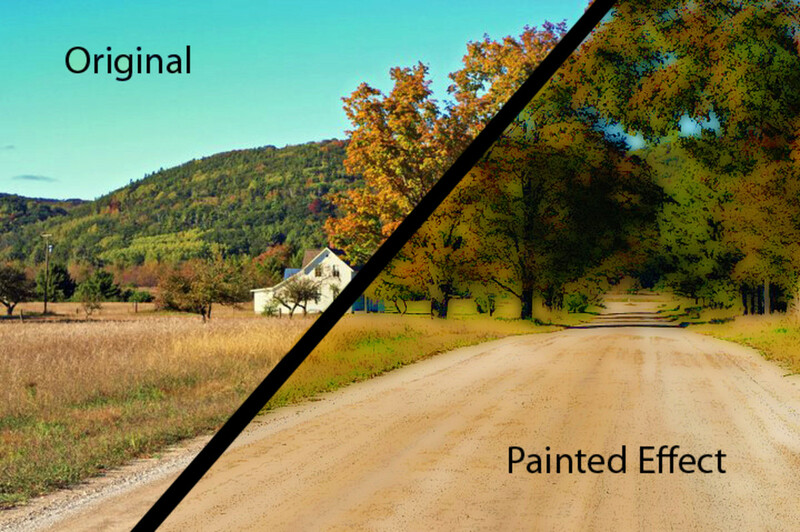 Change the Opacity to 100%, Angle to 120 degrees, Distance and Size to 10 pixels and Spread at 0%. Click the Bevel and Emboss button. Change the Depth up to 250%, Size to 35 pixels and Direction to “down”. Change Technique from Smooth to Chisel Hard. This looks fine if the letters were carved out of marble but it should be softer for gold. So raise the Soften to 5 pixels. In the Shading portion of Bevel and Emboss, next to the Highlight Mode, click on the color swatch. Change the H to 45, S to 50 and B to 100% for a golden orange highlight. Change the Opacity to 100%. Change the Highlight from Screen to Linear Dodge (add). Next to Shadow Mode, click on the color swatch and change H to 45, S to 100 and B to 30 for a brown shadow. Change the mode from Multiply to Linear Burn. Change the opacity to 85%. Altitude to 60%. Change Gloss Contour to the little icon with two towers marked Ring Double for a more dramatic effect. Also check the Anti-alias box. You could leave the gold here. But for more, click the Satin button on the FX dialog box. Click on the color swatch and change H to 50, S to 85, and B to 50. Change Blend Mode to Multiply. Change Contour to Gaussian. You can play with the invert by checking and unchecking the box to see which you like better. I changed the Angle to 35%, Distance to 12 pixels and size to 20 pixels. For a more dramatic sparkle, add another layer and call it sparkles. Go to the Brush Tool. Making sure the white is till the foreground color, Size the brush to 50 pixels and Hardness at 0%. To increase the size of the brush, press the right bracket key, “]”, several times. Click on the edge of the letters to give a white highlight. When you are happy with the highlights you need to make a layer mask so the highlight is only on the lettering and not on the background. 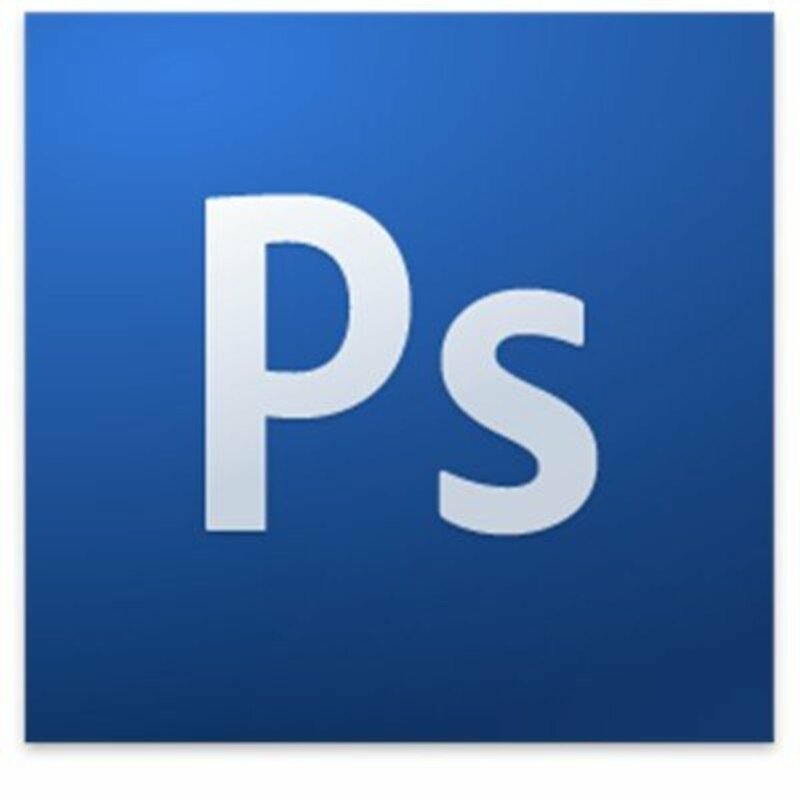 To make the layer mask, holding the command key and click on the text layer. With the sparkle layer still highlighted, drop down to the “add layer mask” icon at the bottom of the layers panel. Click on it and the mask eliminates all the white spillover. I like to use the star brush that came as a preset in Photoshop. They look spiffy. I think so too. Thank you so much. It is really easy to change into another word or phrase without having to redo the effect too. This is beautiful. I could see this on a Pinterest style image, perhaps for a music hub. So kind of you to think so. I really like the gold effect and it is so easy to create. 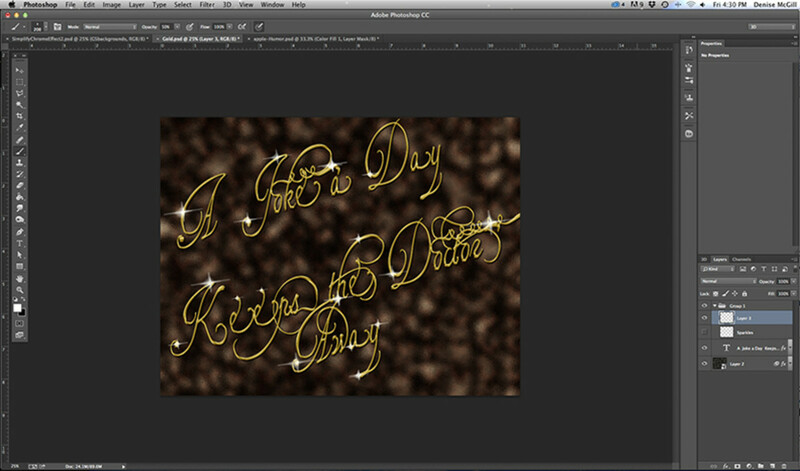 I should use bolder fonts but the thin little fonts make it look elegant like filigree or tiny gold necklaces... girly. lol. Thank you. I'm so glad you like it and hope you can use it yourself. It's pretty easy. I hope you can use it for your own work sometime. Thanks for the comment. Thanks Denise for the informative hub on Golden text. I love how it looks. Thank you very much. I appreciate your comment and your visit. 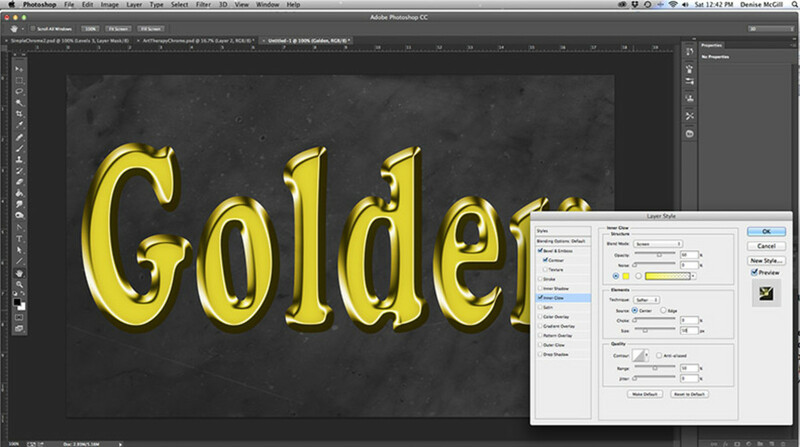 Very interesting and useful article on using adobe photoshop in creating wonderful images with golden text. Thank you very much. 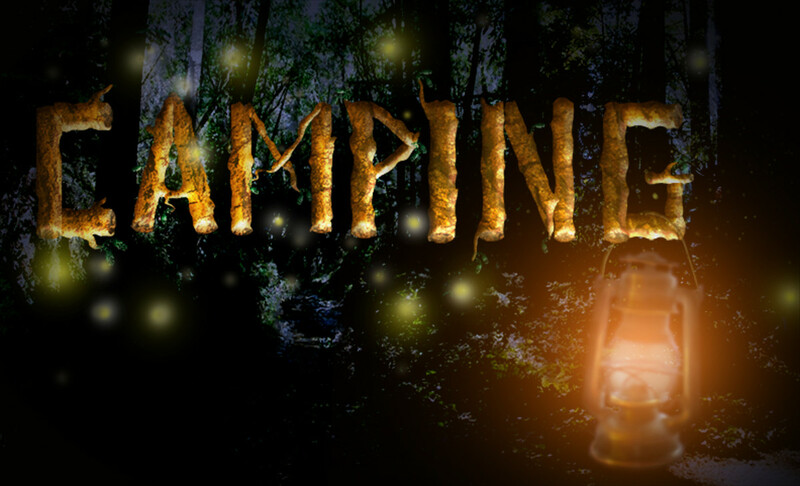 I like doing these kinds of text manipulations so I can use them for my hubpages.